English literature is a treasure trove of wonderful poetry. From Shakespeare to Milton, Keats to Shelley and Tennyson to Yeats, this accessible history (especially written for Naxos Audiobooks) introduces the listener to countless small masterpieces, including all the old favorites and some lesser-known gems. Whitfield explores this most expressive of art forms and traces the historical development of a rich and diverse canon of poetical works. The lyrical powers of the most remarkable poets of the English language are illustrated with over 70 extracts. 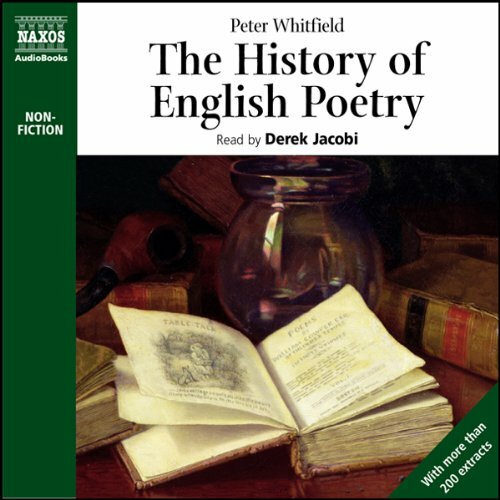 This is the latest release from Naxos Audiobooks' successful History series, which includes accounts of English literature, theatre, and opera. This is an engaging survey of English language poetry, incorporating poems from both England and America. The mark of a good survey is that is leaves you wanting to dig deeper into the subject, and this certainly book does that. The book covers not only different poets, but the development of poetry over the centuries, and it left me wanting more. Derek Jacobi is an excellent reader, but he doesn't read most of the poems. The readers of the poems are themselves good, but be warned: poetry takes more concentration and involvement than our multi-tasking, couch-potato society is used to, and you'll find yourself rewinding to rehear many of the poems. It is well worth it. The combination of the writing and narration is so stimulating that I often had to pause it so I could consider what I just heard. I enjoyed the general sweep of the history and discovered some poetry not previously on my radar. I would have never believed that Derek Jacobi could sound as dull as any college professor until I started listening to this book. It made me leave the book, then come back to it, only to leave again. Yet my love of poetry is so strong, I kept coming back. Then I found my mistake. It was not Mr. Jacobi who made the book hard to listen to. It was the poetry, the old 'must be translated into modern English to understand' poetry. For after Spense comes Shakespeare and then (for me) the poems begin to sing and Derek Jacobi's wondrous voice gave the poems wings. So I listened, and back tracked, and listened again. Wordsworth, Shelley, Keats, Browning, Kipling, Whitman, Longfellow ... and the list goes on. Not enough of any one poet, just a reminder of the feasts they have laid before me. So now I have pulled my dusty poetry books from the shelf and begun to read again. What did you like best about The History of English Poetry? What did you like least? This narrative filled in some gaps in my knowledge of English poetry (or more correctly, poetry in English, since American poets are also included). The text is adequate, but pretty dry and somewhat dull to listen to. Mostly it's a run-through of major poets and trends in poetry over time, with short examples from actual poems. Although it's a fairly recent book, the coverage ends with poets writing in the mid-20th century. Would you be willing to try another book from Peter Whitfield? Why or why not? Probably not, unless I heard from other people that it was more interesting and lively than this one. Derek Jacobi's reading is very good, as expected, although I wish someone had told him how to pronounce "Lanier". The short quotes from individual poems are read by other British actors, some of whom are better readers than others. In particular, their attempts to mimic American regional accents are on the level of Vivien Leigh playing Scarlett O'Hara. Surely they could have brought in a few native speakers to do the American poets with strong regional or ethnic associations. Do you think The History of English Poetry needs a follow-up book? Why or why not? No. It covers the topic adequately.